Breast augmentation is a surgical procedure that changes the size and shape of a patient’s breasts using implants or fat transfer. There are many reasons why a woman may want to enhance the size or shape of her breasts. Some women prefer a fuller bust, while others would like to reduce the toll that pregnancy or breastfeeding have taken on their bodies. Others would like to reduce asymmetry in their chest, increase the size of their breasts to achieve a balanced figure, or even revise a previous surgery. Whatever your reasons and ultimate goals may be, Dr. Sara Yegiyants can help. As a triple-board-certified plastic surgeon with extensive formal study in art, she has helped many women feel great about their bodies. Our boutique plastic surgery practice in Santa Barbara is a wonderful choice for breast augmentation surgery, as we have extensive experience in enhancing our patients’ appearances and boosting their self-confidence. Breast augmentation surgery involves placement of an implant to enhance the shape and size of the breast. The surgical incision may be made in a number of places to allow placement of the implant or fat tissue. The location of your incisions will be carefully chosen to minimize visible scarring. Common incision locations are in the crease under the breast, around a portion of the areola, or trans-axillary (in the armpits). The location of your incisions depends on a number of factors, such as the size and type of implant that will be used and whether or not you are also having a concurrent breast lift procedure. Regardless of where your incisions will be, Dr. Yegiyants will study the contours and texture of your skin and work to minimize scars, leaving your skin beautiful and smooth. After the incision is made, a pocket can be created for placement of the implant. Once the implants have been placed and adjusted as necessary, the surgical incisions are closed, usually using stitches that dissolve on their own. The procedure usually lasts about one hour. There are many options available to patients when they are considering breast implants, and we are certain to find the right fit for you. We use only state-of-the-art, FDA-approved implants. After carefully considering your aesthetic goals and the natural features of your body and breasts, Dr. Yegiyants will recommend implants that most complement the natural architecture of your breasts to achieve the look you want. Fat-transfer breast augmentation uses fat removed from the patient via liposuction; it is generally chosen by patients who want a small increase in size and a very natural-looking outcome. Saline-filled implants have a silicone shell, and they are typically filled with saline after placement during surgery. This allows the surgeon to adjust the amount of fluid in the implant, providing flexibility in the size of the implant. Silicone implants have a more natural feel and are filled with a silicone gel. Form-stable silicone gel implants, also called “gummy bear” implants, are filled with a more cohesive silicone gel. Patients may also choose rounded or anatomical-shaped implants, and some may be textured to minimize movement of the implant. For patients who have asymmetrical breasts or who may be undergoing a revision breast augmentation, it is not uncommon to use different size implants in each breast. Breast implant placement may be sub-muscular (under the pectoral muscles), sub-glandular (directly behind the breast tissue over the pectoral muscles), or sub-fascial (under the fibrous connective tissue covering the pectoral muscles). There is research evidence to suggest that sub-fascial placement of breast implants provides a more comfortable recovery and has fewer disadvantages, such as rippling or bottoming out, than other placements. This is because the placement keeps the pectoral muscle intact while sequestering the implant securely behind the fascia. Additionally, because there is no pressure of the muscle on top of the implants, better projection and perkiness can be obtained with smaller implants. Because of the advantages of this positioning, Dr. Yegiyants prefers the sub-fascial placement when possible. In fact, she is the only plastic surgeon in the Santa Barbara area who is preferentially performing sub-fascial placement of breast implants. In our boutique practice, you will meet with Dr. Yegiyants right away when you come in for your consultation. We encourage our patients to bring in images that can help us to understand their aesthetic goals. 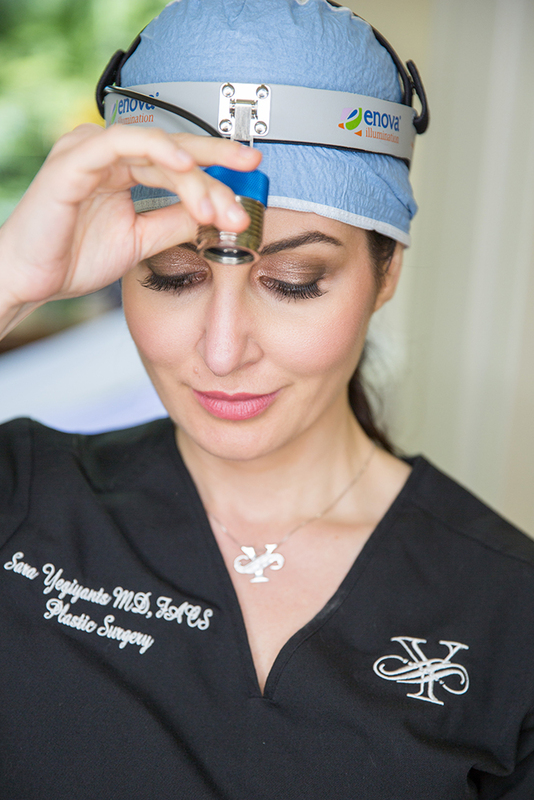 Dr. Yegiyants will draw upon her extensive training in the arts to create recommendations that are customized to your body, and she will take the time necessary to make sure she fully understands what you want for yourself. Each consult is a personal and individualized experience – we strive to make sure we know your goals while providing the best possible care and service! After surgery, you will have a compression bandage in place to protect and support your breasts and minimize post-surgical swelling. You will be able to leave the hospital on the same day as your procedure and should expect to rest for the first few days following surgery. You will be most comfortable sleeping on your back initially. Most patients are able to return to regular daily activity within a week or two after their procedure but should refrain from lifting anything heavy for several weeks. You will notice immediate results from your surgery, but it may take several weeks for your swelling to subside and your implants to settle into their final position. It is important that you follow all post-operative instructions to maximize your healing and promote the best possible outcome. Breast implants do not last forever; most last 10-20 years. Implants do not usually create complications for breastfeeding if you should become pregnant and choose to nurse. You will also be able to have mammograms for breast cancer screening.